Dowel screws are double ended wood to wood screws. They allow you to fix two pieces of timber together securely. 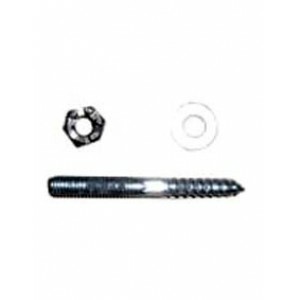 These dowel screws are ideal for use with continuous handrails as they can join the parts together seamlessly. Create continuous handrails, also known as over the post handrails, this selection of handrail parts are all designed to be used with our deep staircase handrails. Continuous handrails produce smooth lines on a staircase for a sleek but striking appearance. Parts for producing these over the post handrails include decorative volutes and end scrolls, perfect for finishing your handrail. All these parts are available in a choice of timbers to match the rest of your stairs. Our timber parts are produced in a range of different styles that you can combine or mix and match to create your own unique design whether it’s a new staircase or a refurbishment of an old staircase.